Media Awards sponsors this year were Chase 54 apparel company, Nexbelt, Wilson Golf and PGA Golf Exhibitions. Golf Channel’s Morning Drive show host Damon Hack served as the master of ceremonies. The Met Golfer, the New York City-based behemoth among regional publications with a circulation of more than 100,000, led the way with nine individual awards. First-Place Winners from the New York-based magazine were: Tom Mackin in the Business Writing category, Ken Van Vechten in the Equipment & Apparel Writing category and Craig Brass in the Travel Writing category. There were several other multiple award winners (either First Place or Outstanding Achiever). They included freelance writer Jeff Gilder of iNet Golf, Kevin Kane from Virginia Golf Report, Ken MacLeod of Golf Oklahoma, freelancer Sally J. Sportsman, Rich Styles of The Back 9 Boys radio show, freelancer Ed Travis, freelancer Gary Van Sickle and freelancer Len Ziehm. 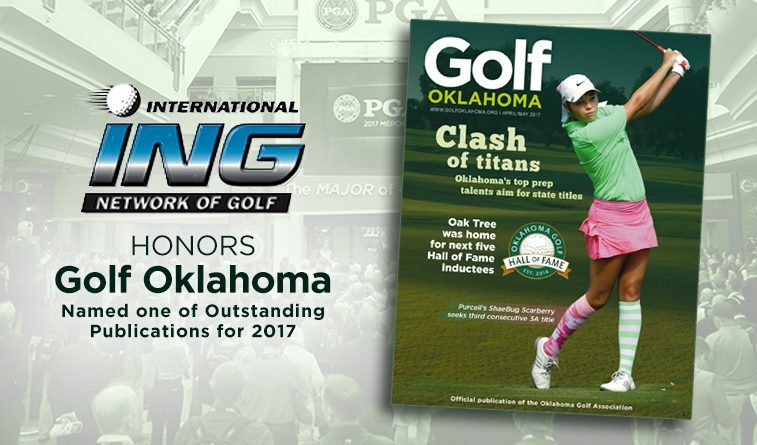 Golf Oklahoma was honored in the categories of publications, opinion writing (Ken MacLeod), business writing (Ed Travis) and equipment writing (Ed Travis). An independent panel of three judges in each category determines first-Place Winners and Outstanding Achievers. Judges use a point system with several criteria. Scoring is done by judges when possible without knowledge of the person responsible for the work, or of the other judges in the category. The number of Outstanding Achievers in a category is determined by total entries and scoring range in the category. Outstanding Achiever: Tripp Bowden (“All The Memorable Rounds”); Tom Callahan (“Arnie”). 1st Place: Tom Mackin, The Met Golfer (“Thrown For A Loop”). Outstanding Achievers: David Barrett, The Met Golfer (“Game Changer”); Jeff Gilder, TGD Magazine (“Reinvesting In Myrtle Beach”); Ed Travis, Golf Oklahoma (“Mixed Signals: Good And Bad News For Retailers”). Outstanding Achievers: Kevin Kane, Virginia Golf Report (“Longest Day in Golf Has Become Most Exciting Day in Golf”); Gary Van Sickle, MorningRead.com (”U.S. Open Trophy Shines for Qualifiers”); Len Ziehm, Chicago District Golfer (“Make It A Double”). 1st Place: Ken Van Vechten, The Met Golfer (“Forging Ahead”). Outstanding Achievers: Mike Kern, Golf Pennsylvania/Golf Northeast (”Fitting”); Ed Travis, Golf Oklahoma (“Driving Miss Daisy”). 1st Place: Ed Travis, The A Position (“PGA TOUR Superstore Bucking The Trend”). Outstanding Achievers: Bill Fields, The Met Golfer (“Future Stock”); John Paul Newport, The Met Golfer (“Best Practices”); Sally J. Sportsman, SeniorGolfInsider.com (“Arnold Palmer Cup: A Lasting Legacy From the King”). 1st Place: Bob Oliver, Golf Insiders Radio Blog (“Rules Call Ins: Stop The Insanity”). Outstanding Achievers: Kevin Kane, Virginia Golf Report (“Joggers and Leggings and Plunging Necklines, Oh My”); Ken MacLeod, Golf Oklahoma (“City of Tulsa Golf Courses in Need of Champion“); Ed Travis, The A Position (“Fuzzy Thinking”); Gary Van Sickle, The Morning Read (“Reality Check on Distance Gains: Don’t Worry, Be Happy”). 1st Place: Gary Van Sickle, Memorial Tournament Magazine (“William McGirt, The Nice Guy Who Finished First”). Outstanding Achievers: Adam Schupak, The Met Golfer (“Jake (Heart) NY “); Sally J. Sportsman, SeniorGolfInsider.com (“Giving Back: Dr. Edwin B. Cottrell”); John Steinbredder, Global Golf Post (“Sughrue Surges on The Right Path”). 1st Place: Colorado Avid Golfer, 15th Anniversary Issue (Jon Rizzi, Editor). Outstanding Achievers: Golf Minnesota (Greg Wires, Publisher); Golf Oklahoma, April/May 2017 Issue (Ken MacLeod, Publisher); The Met Golfer, August/September 2017 Issue (Jeff Neuman, Editor). 1st Place: Sports Innerview, With Ann Liguori on NPR’s WPPB Public Radio. Outstanding Achievers: Back9Boys Golf Show, ESPN Coastal, Rich Styles Host; Golf Talk Live, ESPN Lehigh Valley, Tony Leodora Host. Outstanding Achiever: Holly Geoghegan, The Golf Insiders, iHeart Radio, Orlando. (“Arnie’s Legacy Lives On”); Rich Styles, Back 9 Boys, ESPN Radio (“Davis Love III Interview”). 1st Place: Tony Leodora, The Traveling Golfer (“St. Augustine”). Outstanding Achiever: Jeff Gilder/Brian Stefan (“Amateur Long Drive World Championship”). 1st Place: Craig Brass, The Met Golfer (“Come In, We’re Open”). Outstanding Achievers: Ray Tennenbaum, Ray, The Met Golfer (“Vive Le Golf”); Len Ziehm, Daily Herald (“Simply Grand”).